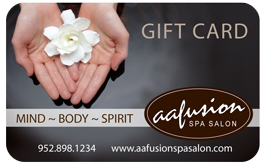 Janet joined aafusion in 2009, she has been in the beauty industry for 26 years. A 1984 graduate of The Aveda Institute (formerly known as Horst), Janet was on the MCA Board of Esthetics for 5 years with skin care and trend make-up. In the course of her career Janet has taken several advanced training classes in Skin Care, Body Treatments, Make-up and waxing.